In my past reviews I’ve been critical of the 3D movie fad. Capitalizing on the success of “Avatar”, studios began seeing the profit potential of 3D movies and decided to convert films in the post-production phase that weren’t suited to the needs or effects of 3D technology. It’s been over three years since “Avatar” was released and since then a whole slew of 3D movies have come out, many failing to impress audiences and justify their expensive ticket prices. After viewing the James Cameron produced “Cirque Du Soleil: Worlds Away” performance film in 3D, my lack of enthusiasm for 3D movies remains – except when the technology is used by this man. The Andrew Adamson directed film captures the beauty and mystery of Cirque Du Soleil, and with the help of 3D, makes the audience feel as if they watching a live performance. The film is a visual marvel and manages to hold the audience’s attention even when it becomes abstract and the weak plot fails to connect the episodic structure. “Cirque Du Soleil: Worlds Away” is an immersive cinematic experience unique to theatres this year. The film begins with a narrative prologue set in a fairground. A young woman named Mia, curious about the fair, begins exploring and meets The Aerialist, a performer in the trapeze show. The two share an instant connection. Mia goes to see the trapeze show, but the world around her begins to change. As The Aerialist performs, he falls and is sucked into a sinkhole that carries him to another world. Mia jumps in the sinkhole as well to find and save him. The narrative prologue had all of the emotional and technical appeal of a high-budget music video. Thankfully, it was only about five minutes long, but it was a very typical and poor start to the film. After Mia and The Aerialist enter the sinkhole, the tone and atmosphere of the film changed completely. Essentially the rest of the film concerns Mia and The Aerialist trying to find each other in a surreal fantasy world represented by different performances of Cirque Du Soleil. As Mia and The Aerialist navigate this new world they encounter a variety of characters, settings, and performances. The performance segments of the film are taken from a few different Cirque Du Soleil shows that are currently being performed all around the world including, “O”, “Mystere”, and “Love” (the Beatles inspired show). For the most part, combining performances from different shows worked for the episodic plot structure of the film, but some of the sequences didn’t match the tone of the film or the other performances as a whole. A superhero inspired Elvis performance piece would have been great on its own, but didn’t match style of the film at all. The use of 3-D technology in this film is the best I have encountered since “Avatar”. I have never seen a 3-D movie look so crisp and seamless, and actually make the filmed images look realistically dimensional. Of course, there are the obligatory gimmick shots of having stuff look like it’s flying at the audience’s faces, and a few repetitive shots of water droplets splashing, but for the most part the 3-D was effective and complimented the film’s performances. The limits of filming Cirque Du Soleil were apparent though even with the help of 3-D. The best segments were the ones that focused on a solo performer, or the simpler acrobatic pieces. When there was a lot of action, or a large group performance, the camera failed to capture what would probably be best seen live, and editing choices segmented the piece by focusing on individuals instead of the group. “Cirque Du Soleil: Worlds Away” is a really great example of the capabilities of 3-D technology and how it can be used to optimize the viewing experience. The film isn’t put together well in the narrative sense, but the incredible visuals of the performances make this a worth while film to see in theatres. 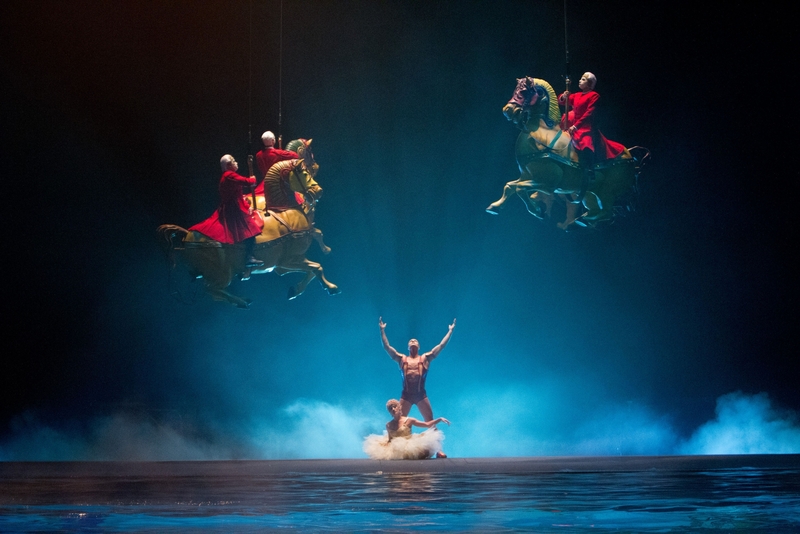 There are currently no comments on Movie Review: “Cirque Du Soleil: Worlds Away” – 3D Captures Imagination. Perhaps you would like to add one of your own?